In order to cut a recess is your tabletop to hang your router, you must first make a template. There are several ways this can be done, in this tip we include information on two different ways. Our recess in our table is located approximately 3 3/4' from the left hand side of the table top. We used a piece of 1/4' masonite to make our template. We need to make our template 1/8� larger on all four sides of the base plate because we are using a 1 1/4� guide with a 1� flat bottom bit to cut the recess in our top. We used 1/8� brass bars as a spacer between the plate and the plywood strips. 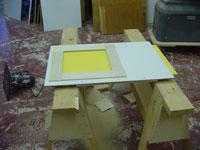 Attach the plywood to the masonite with double stick tape and/or screws. 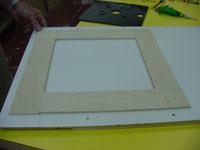 Attach the plywood to the masonite with double stick tape and/or screws. 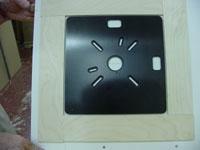 Once secure remove the base plate. Drill a hole for a starting point. This is the template for option 1. Place the template on your table top material. Mount the base plate on to your router, use a 1 1/4� guide and a 1� bottom cleaning bit. Bottom out the bit to the table top and set the depth the thickness of the base plate. Cut the recess moving in a clockwise direction. 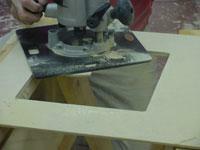 Change the cutter to a 3/8� spiral bit and using the same template cut through the table top. You will now have a recess the size of the base plate with a rabbet cut for the base plate support. Again using a scrap piece of masonite, cut a square opening (with a table saw or sticks as shown before with a flush trim bit)making sure it is exactly 3/8' smaller on all four sides of the base plate. Use a flush trim bit to cut a opening this size (3/8' smaller than the plate). Now use a 3/8" rabbet bit to cut the recess the thickness of the plate. To make sure that your template is correct be sure to make a test cut from scrap material first to be sure that everything fits nicely before cutting in your final table top material.